The big day is finally here! 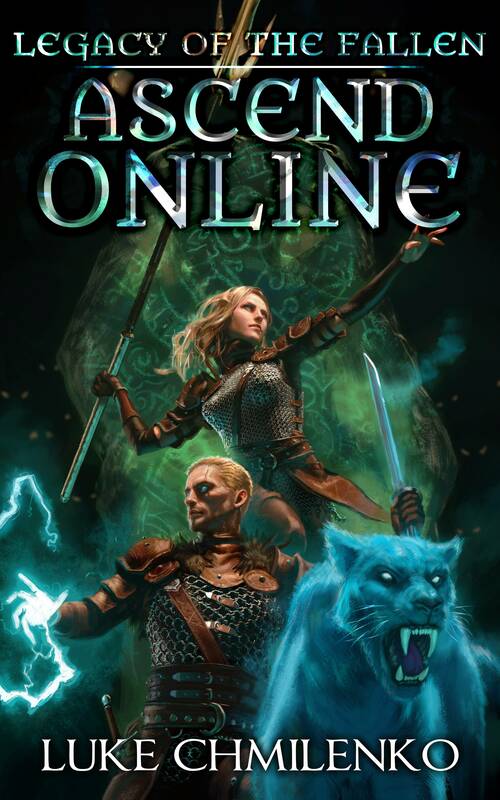 Ascend Online: Legacy of the Fallen is now live on Amazon! Yay! It has been a huge run coming up to this point, but I am happy to say that the book turned out absolutely amazing! I’m not going to keep rambling on any longer than I have to! Here are the links that you need! Awesome look forword to the audio book when it comes out as I am a truck driver and devour audio books.. Just finished the 1.5 audio book and want more. Awsone books and so glad you don’t go overboard on stats etc. Just finished the first book and absolutely loved it, I can’t wait for more. Luke Daniels absolutely does your work justice! Keep on doing what you’re doing. Any idea of when we will get the Audiobook? Haha! This book is going to be a long one! So the production time is going to take some time to get it all sorted out! I promise I’ll have updates soon as I know more! Thanks for the ETA Luke. I guess I’m not the only one looking forward to listening Luke D reading Luke C.
look(Luke),forward to both audio book and Ebook. Grabbing the ebook now. Loved the first book! Can’t wait to get my hands on the audiobook; I like getting a series all in the same format. Plus, Luke Daniels does a fantastic job on everything he reads; if you had a hand in picking him, I applaud your choice. Anyways, I came here to check if it was going to come out, so I’m happy it’s on its way. I’ve seen other series by new authors stop after the first audiobook. Love the series, my favorite LitRPG for sure. And I actually thought what you did with book 2 was great! There are tons of players in a huge new world and some are doing equally important things, getting to see some of these other people, and places make the world start to feel as large as it’s supposed to be. Most other series talk about how large the world is, and how populated, but it never feels like it because the focus is usually so narrow. Having another character shown that is also changing the world in important ways, and then eventually connecting the characters is awesome I think. Plus we got to see a totally different play style, And landscape. For me that was a refreshing change. Can’t wait for book 3 to come out on audio, Luke Daniels does an amazing job! I can’t wait for the audio either! Hopefully we’ll have some more details coming from that in the next couple weeks going forward! Fingers crossed! I greatly enjoy your books and have loved the audiobooks is there a timeline as to when we might expect book 3? I know you said aprilish/may time frame just wondering if that has been more solidified since beginning of march. Hi Josh! Legacy of the Fallen’s Audiobook will be out on April 24th with the preorder hopefully going up this week or next week! Awesome job! I’m a fan of your work and I must say that Luke Daniels did a amazing job. Just finished listening to all three books. Keep up the good work! Wow! That is high praise man and I really appreciate it! 🙂 I’ll keep working hard to make sure I don’t let you down! This has got to be one of the most addicting books I’ve listened to lately. I listen while on the road (my job requires me to drive around a lot) and I’ve taken all three around with me the last few days. After breaking a record and annoying my girlfriend and co-workers with listening to them none stop; I’ve finished. It’s clever! It only reinforces the idea that a book about MMORPGs can be compelling and entertaining. If I ever manage to finish editing a my story which is in a similar category then I tip my hat to you for the inspiration of finishing it. I read the first book on Kindle, and loved it, then found Ascend Online on Audible books. loved it there too. I couldn’t wait to hear more. Found Hell to Pay on Audible and really enjoyed it too even got my wife to listen to it and she fell in love with it. Then got Legacy of the Fallen on Audible. Now I have the full 3 books on Audible I can’t stop listening to them while waiting for the next book/books. My wife Loves, Amaranth, and keeps listening to them several time also. Just wondering when the next book will be out even in print but would prefer audible to continue listening to them while working or even just relaxing. Hey! I am so happy to hear that you and your wife have loved the series so far! 🙂 I’m working away on the next book right now and I am hoping to have it out in ebook form in early 2019, and likely in audio a few months afterward. It’s going to be a fairly long book again, so hopefully I can get it all done as soon as possible! Once I have a more firm timeline on what’s happening, I’ll be sure to post it here and on my facebook pages!